Look at Lardo over here! At first I thought this guy ate David. Turns out, he is David. Dude has really for real let himself go. 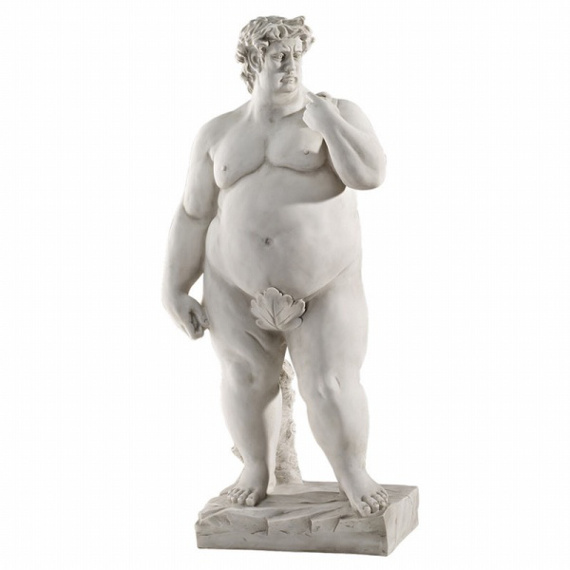 The garden statue measures 30 inches high which probably matches the circumference of his fatty fat waist. Amirite?! I bet Michelangelo never imagined his perfect physique of the male specimen would eventually be recreated to look so… rotund. But who am I to talk? I could say I’m big boned but the truth is I’m f***ing fat. And I’m about to eat lunch AGAIN. For the third time today. That’s a follow up to the two breakfasts I devoured and that’s not even including the brunch I squeezed in juuuust before noon. Oh — you hear that? Sounds like a samwich calling my name. Comiiiiing! Shame on you for making fun of fat people. Even if you take it and turn it around on yourself, that was just wrong. Fat people have feelings too.